If you’ve ever used products from the home-furnishing retailer IKEA for a remodeling project, you might be familiar with its virtual Planner Tools, a Web interface that allows you to set up and decorate rooms. IKEA actually offers a 3D Kitchen Planner, a 3D a Wardrobe Planner, a Storage Planner, a Children’s Storage Planner, and an Office Planner. Earlier this year, the company announced a pilot virtual-reality app called the IKEA VR Experience. According to Remodeling magazine, though interactive, the IKEA VR Experience is limited in its functionality, as the floor plans are static. They compare the service to Chief Architect’s Room Planner, an architectural home-design app for the iPad. Chief Architect plans to implement virtual reality “when it works well enough to help customers see and feel the space,” according to Chief Architect’s Vice President of Sales and Marketing Scott Harris. You may have seen the “Property Brothers” show on HGTV. When the show’s stars reveal their proposed remodeling plans to homeowners, the 3D animations illustrate exactly what the room will look like when they are done. They use a service called NEEZO Renders, which blends 3D art and technology to virtually bring a remodeled room to the viewer. On a smaller scale, there are affordable programs like Punch!, which can help homeowners with no design experience create and use their own plans. 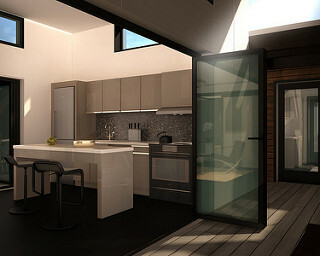 Another option is SketchUp, which offers a free version. Lowe’s has developed a digital tool called Holoroom. The program is limited to designing kitchens and bathrooms at this time, and it doesn’t allow for walk-throughs just yet. Holoroom uses Oculus Rift but can be exported to YouTube 360 and viewed with Google Cardboard. As of January 2016, Holoroom was only available in two states — Colorado and Ohio — but will be rolled out to additional states over time. Consumer Reports took Holoroom for a spin; you can check out the recap here. In fact, Consumer Reports lists virtual reality in its article, 5 Top Home Remodeling Trends for 2016. Earlier this year, Digital Trends took a look at how virtual and augmented reality dominated the International Builder’s Show in Las Vegas. “The home improvement space is a fantastic place for augmented reality (AR) and virtual reality (VR) to take off,” Marxent Labs CEO Beck Besecker told Digital Trends. Besecker’s company’s VisualCommerce platform builds virtual-reality applications. From where to put the fridge to swapping out paint colors to viewing a dream deck, virtual reality allows homeowners to take their ideas for a test drive before committing to the actual work. Maybe you thought the kitchen would look great with a large island and gray walls, but through virtual reality, you see the space looks dark and cramped. Back to the drawing board, and it didn’t cost you an arm and a leg!